In this video above I demonstrate how you can use the Stealth EA to trade range bound markets, what price levels to use, the benefits of hidden pending orders and why using semi-automated FOREX trading tool like this EA can give you more sleep or free time. Stealth EA is an MT4 trade manager designed for everyday trading in the Forex market. Its main purpose is to hide as many of your trading actions from the brokers as possible; I call this invisible Forex trading. This EA can hide the stop loss, take profit, entry price and expiration time of any trade while allowing you to adjust them with your mouse. Stealth EA will serve you as a wonderful trading tool in manual trading, and you won’t believe the advantages it can offer. This EA can even work with other Expert Advisors and manage their trades as well. Stealth EA is an add-on for MT4 terminal which can “trick” a broker into not knowing where your stop loss and take profit levels are. This also means that you can set stops within their minimum distances and they will still work. You can set stops as small as 0.1 pip (on 5-digit broker). This EA is designed for the MetaTrader 4 platform and it can be used with any Forex broker, any MT4 account and any currency pair. With Stealth EA you will be able to hide your trading habits and styles from your broker. You can set the EA to open trades at the specified price when you sleep or while you’re busy living your life. The EA can monitor your trades and close them at a convenient time, and apply hidden trailing stop, hide stop or profit values. There is no limit to how many instances of this EA you can run on the same account, using different options and managing trades from different MT4 robots and manual traders. Hidden stop loss should always be smaller than the real stop loss (the one that broker can see) so that the Stealth EA close the trade earlier and fool the broker that way. Please note that Stealth EA is a trading tool, and it does not open trades without human intervention. It does not trade Forex market alone. It is used in manual trading or with other 3rd party Expert Advisors. Stealth EA can not be used in StrategyTester, and there are no back tests available. This App is for Tech-Savvy Users. Why you need Stealth EA? Stealth EA is useful if you want to hide any of your trading logic from a broker. The EA will fool your broker about your stop loss and take profit values and will not let him know where your pending orders are, what size they are, or when you plan to close your trades. For your convenience EA also allow you to adjust the hidden levels easily on a chart by simply dragging lines with your mouse. Forget the confusing stop loss or take profit calculations, just move the line to a new price and it’s changed immediately. You don’t need to endure any more sleepless nights monitoring your trades just to close them at a specified time, Stealth EA will get this done for you too with vertical close lines. Are you a full time Forex trader and use the MT4 platform? Do you have an MT4 account where you receive trading signals from a 3rd party provider? In this case, Stealth EA is a must-have tool for you. Every trader will find it useful in currency trading and it enables you to do more with less effort. 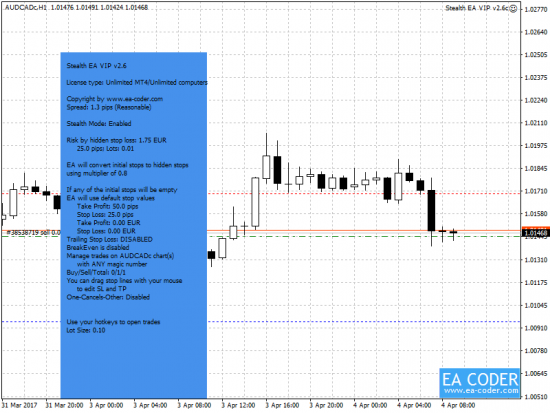 This EA can protect your trades with an invisible stop loss in case you or your signal provider forgets to set one, or it can use the invisible trailing stop function. You can also set your trades to be closed on Friday before the end of your broker’s trading hours. A handy one-click trading feature would be a great help for anyone who does any type of currency trading in MT4. This EA has that feature, and you can open buy or sell trades with a simple keyboard shortcut like Ctrl+4 or Ctrl+5. Trade settings are preset in the EA inputs and a trade will already be placed with invisible stops and a magic number. Imagine a scenario where you follow a signal provider, or use a trade copier, or use some Expert Advisor and they open orders without a stop loss. But if you try to add a stop loss MT4 just keeps changing it back to zero (0.0000). It might not sound very reliable to rely on the signal provider closing the trade when he wants to. Basically, you would have to constantly monitor these trades to manually close yourself if they become too risky for you. Of course, you could apply equity protection on MT4 but this is more for the whole account, not for each individual trade. Stealth EA can help you in such situation and allow you to create a backup stop loss (hidden stop loss). Just note that you will have to run your MT4 with the Stealth EA all the time to apply the hidden stop loss for your orders. Think of a hidden stop loss like a backup stop loss. It’s your backup plan in case your signal provider does not close the trade when the trade reaches a loss that’s too big for you. In other words, Stealth EA allows you to set a stop loss that works even when the real stop loss on MT4 is at 0.0000 and MT4 does not let you change it in the normal way. In Stealth EA, you can set how big your hidden stop loss should be and it will monitor your trades all the time for that stop loss. It will be hidden from the broker and from your signal provider so they cannot remove it or avoid it. When the trade reaches your hidden stop loss the Stealth EA will close a trade and your account will be safe. Obviously, make sure you don’t set your hidden stop loss too small to not ruin the results of your signal provider. Just attach the Stealth EA on a new empty chart on your MetaTrader 4 trading terminal and set your hidden SL/TP. It will take care of the rest. You will see horizontal lines drawn on the chart that represents hidden SL/TP.If your trade does not have real SL/TP then SEA will just create hidden SL/TP as per your settings. If your trade does not have real SL/TP then Stealth EA will just create hidden SL/TP as per your settings. If your trade has real SL/TP then Stealth EA will create hidden SL/TP which will be 80% of the real SL/TP size. You can adjust that size too. For example, if real SL is 50 pips and TP is 100 pips the hidden SL will be 40 pips and hidden TP will be 80 pips. Allows you to hide stops from your MT4 broker by converting them into horizontal lines on the chart. Brokers will not see these lines and will not know where your stop loss or take profit is. Software allows you to set fake, real, stops at a certain distance from the hidden ones. This will fool your broker to think that you exit at the fake levels, but actually your trades will be closed at hidden stop levels. You can move stops with your mouse easily. Just double-click the horizontal line that represents the hidden stop loss or take profit, and drag it to any position you want. You can place an unlimited number of hidden pending orders. Just create regular MT4 horizontal lines on the chart and set the proper description in the properties window. A lot of individual settings can be set for each order. The “Stop and Reverse” trading mode built-in. In this mode all opposite trades will be closed when you use 1-click trading hot-key to open new trade. Very useful if you always want to avoid hedge trades open. You can use special keyboard hot-keys like ALT+2 and ALT+3 to open the trades fast. Each trade will use the settings set in the EA inputs. You can choose your individual Hot-keys for BUY and SELL trades. Allows you to place vertical lines that can be treated as “close trade” commands. You can place unlimited number of MT4 vertical lines, and EA will close the corresponding trades when the right time comes. This feature allows you to delete opposite hidden pending orders when one of them is triggered. Very useful if you want to avoid hedge positions opened on your account. Does not limit the minimum distance allowed for the hidden stop loss and take profit levels. You can set 1 pip stop loss or even 1 point on a 5-digit broker (0.1 pip). Although such low stops are not irrational, you are still allowed to use them. Displays the dashboard on the left on the MT4 chart. It contains various info and EA settings. Dashboard position was chosen wisely to not cover your trade information. For more detailed description of the EA settings and features, please download Stealth EA instruction manual. There are no back-testing results available because all of my MT4 Expert Advisors are trading tools that do not work without user intervention and most of them cannot even be used in Strategy Tester because they only do what a human trader tells them to do. All software on my website are build as tools to help you in Forex trading. Before you make a purchase please read my Purchase Policy. Personal license works on an unlimited Real MT4 accounts and unlimited Demo MT4 accounts on a single computer/VPS. It means you may install the software on your desktop and notebook computers, but use it only on one computer at the same time. EA is not permanently locked to a computer or MT4 account. You can personally transfer the license to another computer/VPS or MT4 account at any time. VIP license works on an unlimited number of any Real/Demo MT4 accounts on max 5 computers/VPS at the same time. It means you may install and simultaneously use the software on 5 computers/VPS as long as they belong to you. Trial version can be purchased only one time. I want to receive weekly newsletter and special offers.